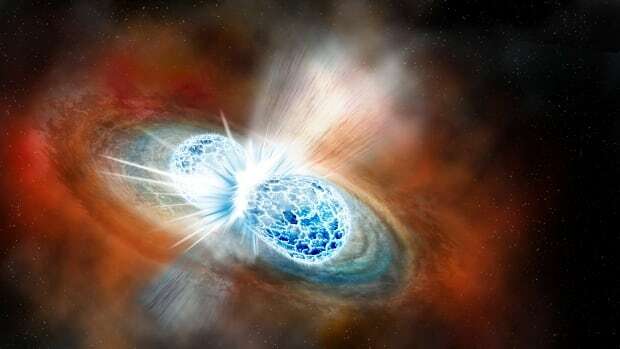 Artist’s rendition of merging neutron stars. The two LIGO observatories and Virgo are the world’s three operational gravitational wave observatories. These observatories use incredibly precise lasers to detect the ripples in spacetime caused by colliding massive objects like black holes. First predicted by Albert Einstein, gravitational waves were first detected in 2015, as I wrote about here. LIGO and Virgo have detected a total of four merging pairs of black holes since then. Recently, the Nobel Committee awarded the Nobel Prize in Physics to Rainer Weiss, Kip Thorne, and Barry C. Barish, the brains behind gravitational wave observation. Today, LIGO and NASA announced a joint campaign that detected the first instance of a new type of gravitational waves: waves created by colliding neutron stars, which also explains the origins of the universe’s heavy elements. Neutron stars are lighter than black holes, so LIGO can only detect them if they’re much closer, but it can detect them for much longer before the final merger—over a minute instead of a few seconds. How they did it is a cosmic detective story much more complex and interesting than their earlier detections. Here’s how it happened. LIGO detected a gravitational wave…but Virgo didn’t. Three gravitational wave observatories around the world, one in Washington State, one in Louisiana, and one in Italy, are used to triangulate the origin of gravitational waves based on the time they arrive at each one. In this case, both LIGO observatories detected the wave, called GW170817, but Virgo didn’t. But this turned out to be okay. You see Virgo (and LIGO) has a blind spot because of how it’s designed—namely, two-dimensionally—and scientists know exactly where that blind spot is: parallel to the direction of the wave. By looking at the directions indicated by the two LIGO observatories combined with Virgo’s blind spot, scientists were able to narrow down its origin to a small patch of the sky, about 10 times as wide as the full Moon, as you can see on this map. The shape of a gravitational wave tells us a lot about where its source: specifically, the masses of both colliding objects and how far away they are. GW170817 was caused by the collision of two objects with masses about 1.5 times as great as the Sun and about 100 million lightyears away, which would have to be a pair of neutron stars. Here’s what the wave would have sounded like as actual sound. Fermi and INTEGRAL detected gamma rays. Fermi is a NASA satellite, and INTEGRAL is a European satellite. Both detect gamma rays. After LIGO detected GW170817, just 1.7 seconds later, both Fermi and INTEGRAL detected a short gamma-ray burst (GRB)—that is, an incredibly intense burst of gamma rays lasting less than two seconds—called GRB 170817A. Fermi doesn’t give directions very well, but it did say that the gamma rays came from the same general area of the sky as the gravitational waves, and they were so close in time that it would have been a huge coincidence if they didn’t come from the same source. It has long been speculated that short GRBs are caused by merging neutron stars, but this was the first direct proof, which is a huge discovery in itself, definitively solving one of the longstanding mysteries of astronomy. Other telescopes hunted down the source. It has also been known since 2013 that short GRBs are associated with events called kilonovae. Kilonovae are stellar explosions that are intermediate in brightness between novae and supernovae. Since a short GRB was detected, and fairly close in cosmic terms, astronomers knew there should be a kilonova at the spot it occurred that they could see. Since they knew the small area of the sky where it happened and the distance, they knew there were only about 50 galaxies where it could be—few enough to just look at all of them. A mere 11 hours later they found it: NGC 4993—an elliptical galaxy with a dusty center. Since kilonovae get their own names, the optical light signature got the temporary serial number SSS17a. Once they had that, they could go to town, looking at the galaxy with dozens of telescopes from around the world and in space, all across the electromagnetic spectrum. Hubble Space Telescope photo of NGC 4993 with the kilonova highlighted. There are three important scientific results that come from this discovery besides the obvious one linking short GRBs to neutron star mergers. First, gravitational waves and light travel at the same speed. This was already known, but it’s always good to test your theory to greater precision. After all, a small discrepancy in the orbit of Mercury was what led to Einstein’s theory of general relativity in the first place. These results prove that light and gravity travel at the same speed to better than one part in a quadrillion! Second, we can use this result to measure the expansion of the universe. The shape of the gravitational wave tells us the absolute distance to NGC 4993—something that’s rare in astronomy. The redshift of the light only tells us the relative distance of one galaxy compared with another based on how fast it’s moving away from us. By combining the two, we can measure the expansion rate of the universe. There are other, more precise methods to do this right now, but in a few years, with more gravitational wave observations, this could become a valuable contributor. Light sources that are uniform enough to measure distances in the universe accurately are called “standard candles”. The gravitational wave is called a “standard siren”. Finally, and most importantly, this discovery proves that heavy elements like gold and platinum do not come from supernovae, or at least not entirely, as was previously thought. Spectral analysis of this kilonova proves the more recent theory that a large fraction of them come from merging neutron stars. This merger produced 10,000 times the mass of Earth (or 3% the mass of the Sun) in heavy elements through a process called the r-process, which is enough to explain the origin of all the heavy elements in the universe within the (very large) observational uncertainty. More observations will be needed to pin down this number better. This is a rich and complicated subject that really deserves its own post, so there will be more on that later. This entry was posted in astronomy, Current events and tagged gamma-ray burst, gravitational waves, kilonova, LIGO, nasa, Virgo. Bookmark the permalink.